Super light weight and ultimate horsepower, that's the Aqua-Bound 2 Piece Manta Ray Carbon Paddle. Featuring Aqua-Bound's largest blade shape, the Manta Ray offers plenty of surface area for tons of bite in the water. 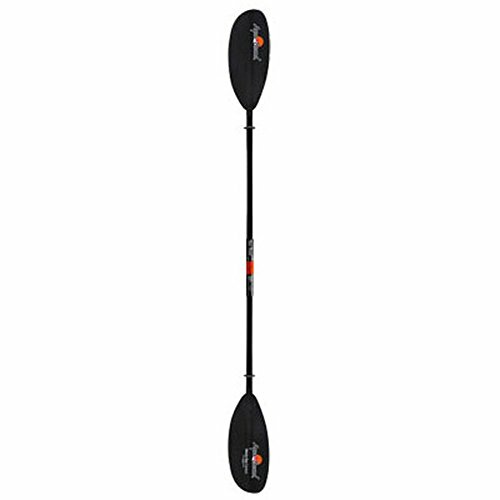 This is ideal for strong paddlers looking for more power, control, or a better workout. While certainly not Aqua-Bound's most efficient blade shape, the Manta Ray is certainly the shape that will get your boat cruising the fastest. The great thing about this paddle is that while the large blade might lack the efficiency of a more streamlined blade, the paddle's overall lightweight carbon construction makes up for it. The Manta Ray features a carbon shaft for superior performance and low swing weight, so all of your energy can go into the water rather than having to wield an ungainly paddle. The abX blade itself is made of carbon-reinforced nylon resin, resulting in a lightweight blade with incredible strength and stiffness. MADE IN OSCEOLA, WISCONSIN, USA. Like all Aqua-Bound paddles, the Manta Ray Carbon 2-piece paddle is hand-built in our facility in Wisconsin, staffed by paddling enthusiasts. 2 PIECE CONSTRUCTION. The Manta Ray Carbon breaks into two pieces with a firm and securely fitting ferrule for easy travel and storage. HIGH-ANGLE PADDLE. The Manta Ray has large, wide blades which are perfect for high-angle paddlers looking to get the most out of every stroke. POSI-LOKTM FERRULE SYSTEM. The Posi-LokTM ferrule features strong, corrosion-free composite construction, convenient dual-button release and infinite feather angles. CARBON REINFORCED BLADES. The Carbon reinforced blades paired with the 100% carbon shaft make for a lightweight and efficient paddle. If you have any questions about this product by AQUA BOUND, contact us by completing and submitting the form below. If you are looking for a specif part number, please include it with your message.